The healthiest meal in a bowl ever! 1 large bunch of kale, destemmed and broken into pieces. We are lucky to have locally grown awesome kale! 1 packet of kelp noodles, rinsed and drained. 3 banana peppers (they are in season at the moment here and so good. You could use any veggie, and red pepper would be especially nice), sliced finely. Blend in high speed blender until smooth. Pour sauce on top of kale, kelp and peppers. 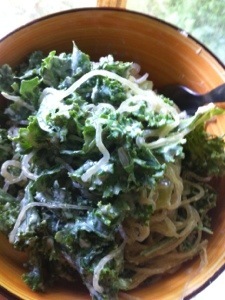 Massage in with hands roughly until kelp noodles are evenly distributed and kale is coated with sauce and softening. Leave to marinate for half an hour and then serve! This meal was sooo nourishing and good! It would be just so perfect topped with homemade sauerkraut or some other type of fermented veggies. We chopped some up superfine and Amethyst gobbled it up!